St. Mark’s Chapel was consecrated in 1857 by George Jehoshaphat Mountain, the third Anglican Bishops of Quebec. St. Mark’s is in the Perpendicular Gothic style, prevalent in England during the Tudor period. The façade, with its fenestration, string course and buttresses, shows the influence of the 13th century’s formal architecture vocabulary. The ogival windows, twinned on the long side and in groups of three on the West façade, repeat the same arrangement which can be seen in Salisbury Cathedral. The entrance door, adorned with a ogival arch, is like that of Eton College in Windsor or Trinity College in Cambridge, England. The Chapel was almost completely destroyed by fire in 1891. Corporation decided to rebuild it on the same site, as a memorial to Principal Nicholls, and during the next six years the superb interior furniture and panelling was completed by the Sherbrooke cabinet-making firm of George Long. Much of the finer carving is thought to have been the work of his assistant, Georges Bélanger. 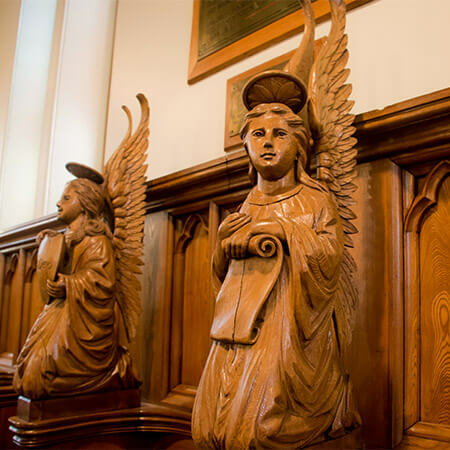 Made of beautifully crafted Eastern Townships ash, the interior of the chapel is most remarkable for the exquisite quality of the wood sculptures. These include biomorphic finials inspired by the Art Nouveau style, eight kneeling angels represented with different attributes while the North wall of the chapel features the four Evangelists. The stained glass windows, by the Montreal firm of Spence and Sons, are in the spirit of middle-age craftsmanship, combined with more modern, industrial techniques. Over the door are scenes of the Old Testament, while the apse features the New Testament, the life and death of Christ. 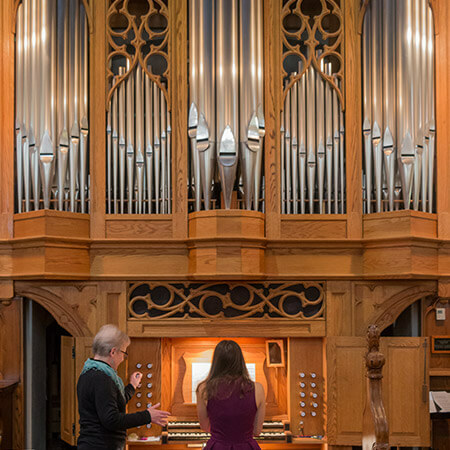 In 1992, the Corporation of Bishop’s University authorized the acquisition of a new organ for the Chapel as one of the Sesquicentennial Capital Funding projects. The new, custom-built tracker organ by Karl Wilhelm, of Saint-Hilaire, Québec. Has a case specially designed to complement the interior of the chapel, a configuration that deals with the position of the organ in a chamber to the side of the chapel, and a set of stops appropriate for the Anglican liturgy whilst also suitable for the classic German and French organ literature.